Do you live in a small apartment or condo in Calgary? Visit our blog and learn how to maximize your space and improve your living environment! Posted by Krista Kehoe on Wednesday, May 15th, 2013 at 5:22pm. If you're staying in the big city and you want to stay in an apartment all on your own, there's a good chance you'll end up with a 500-square foot space or something similar. This may sound daunting at first, but if you know how to maximize what little space you have, it might actually be just enough. The key is to find the focal points in the apartment and making them your main rooms or hangout spaces. Also take note of the permanent features and fixtures because you may need to decorate or remodel around them. You may be able to have them removed, but that's only if your lease contract allows you to. Remove any walls that run across the room. You have very little floor space as it is; don't cut it down further by installing walls. An open space will give you a continuous flow of vision and mobility, which makes the apartment to look and feel spacious. Install sliding doors for your closet instead of swinging doors. 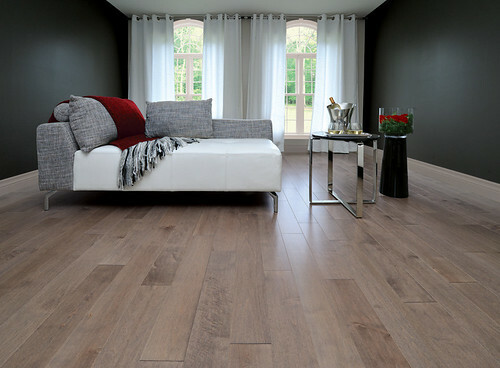 They are more efficient, and therefore more appropriate for a very limited floor space. If you really want to have a division between two rooms, consider using frosted glass walls with open archways instead of a solid, concrete wall with a door. You can do this to separate your sleeping area from the living and dining areas, for example. Go for tall and wide windows, preferably reinforced glass with slim and sturdy frames if your apartment has air conditioning. If it doesn't, French windows would be great. Big windows let in natural light and also promote continuity of vision. These two are old-school tricks in making a small room look bigger inside. 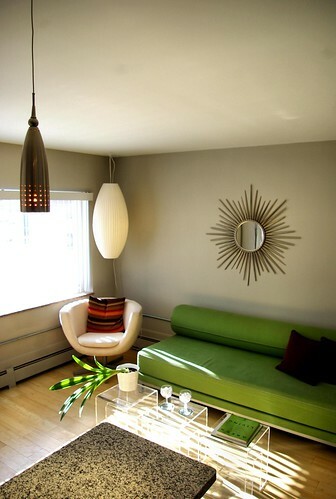 Besides structural design, you need to get the right pieces of furniture and appliances for the apartment. Avoid large, bulky pieces of furniture. They will eat up a lot of floor space and make the apartment look stuffy—and that is different from cozy. Instead, you can have low-height furniture to give the impression of a higher ceiling; a round, glass table instead of a bulky, square dining table; bar stools instead of formal dining chairs; and poufs and ottomans instead of armchairs. Go for glass instead of thick, wooden furniture. Use light colors on your walls, like white, mint, light yellow, and light pink. You can also go for muted wall colors like gray and black. Just don't make your walls all black because it will feel like the walls will close in on you anytime. Choose one background colorPaint different colors (that still complement each other) for each area of the apartment (etc. white in the living room, periwinkle in the dining area, and mint in the kitchen). You also need to match the colors of your furniture, appliances and other decorations with the color scheme of the apartment. Since you're already advised to use light hues, choose a dark color to contrast with the walls. For example, accessorize your white apartment with deep red throw pillows, lamps, and vases. You can put a counter between your kitchen and living room if there's no room for a dining table. The counter can double as your eating area. It would be great if you have pull-out kitchen appliances that are built-in to the cabinets and counter (ex: an electric stove with a cover that's flush with the surface of the counter, a vent that rolls out from the overhead cabinet above the stove). The biggest bed size you can go is a double. Save the king-sized bed for your future, bigger house. Build floor-to-ceiling shelves with sliding doors instead of buying dressers and wardrobes. All these tips will give your apartment a more spacious feel. TinaMadsen is a design enthusiast who brings her passion for modern décor and writing to her role as the NowModern.comblogger. She also specializes in turning small living areas into spacious social hubs with bar stools and counter stools. 1 Response to "Space Maximization Tips for a 500 Sq. Ft. 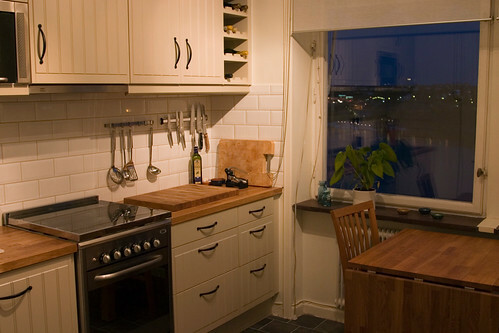 Apartment Space"
Krista Kehoe wrote: These are great ideas, we have a lot of condo buyers that can put this to good use! Posted on Wednesday, May 15th, 2013 at 5:36pm.